DUBAI: Lego fans, rejoice. 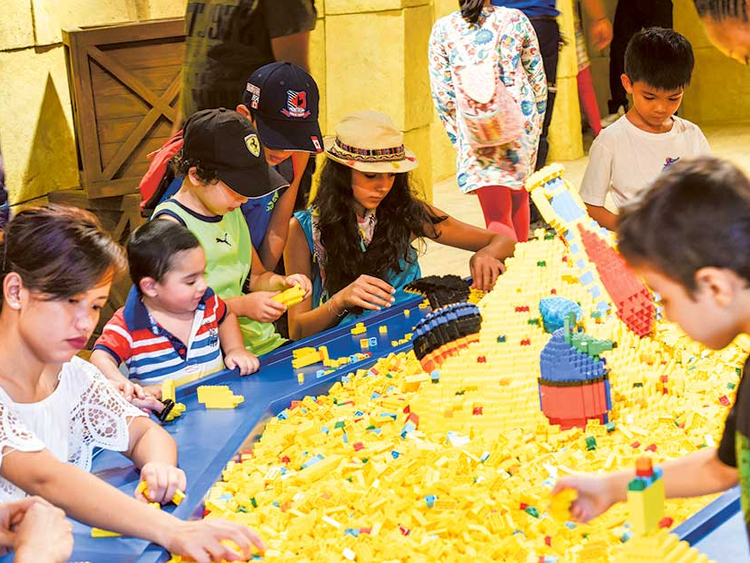 Dubai now has a Lego-themed amusement park. Legoland Dubai, part of the Dubai Parks and Resorts development in Jebel Ali, will officially open its doors to the public on Monday. It had a soft opening over the weekend for annual ticket holders and VIPs. Dubai Parks and Resorts, valued at Dh13 billion according to state news agency WAM, is expected to be the largest multi-themed leisure and entertainment destination in the Middle East, with over 100 rides and attractions actions spread across 25 million square feet of land. “We have been busy putting the final touches on both Legoland Dubai and Riverland Dubai ahead of the opening. It has been an incredible team effort…,” Raed Kajoor Al Nuaimi, chief executive of DXB Entertainments PJSC, the owner of Dubai Parks and Resorts, said by email. The company anticipates 6.7 million ticketed visits and Dh2.4 billion in revenues during the first full year of operations. The building of theme parks is expected to help increase the number of tourists to Dubai. The emirate has set a target to attract 20 million visitors per year by 2020. “The theme park industry is growing in the Middle East with a huge potential to benefit the economy. There are three billion people that live within a four-hour flight of the UAE, and there is a significant gap in this market for a world-class family leisure and entertainment destination,” Al Nuaimi added. Covering a total area of three million square feet, Legoland Dubai is the first Legoland in the Middle East and the seventh globally. Visitors to the theme park can expect to see over 40 interactive rides, shows and attractions across six themed lands. Lego City, one of the themed lands, was built with the younger visitors in mind. Children here can fly a plane, steer a boat, drive an electric car or save a “burning building”. Miniland, the heart of Legoland, features Build a City where visitors can find a 10-metre play table with white Lego bricks enabling them to create their own skyline. If you’re feeling more adventurous, you can experience being in a submarine in Submarine Adventure and learn about marine life. There are 15 million Lego model models at the park, made from 60 million Lego bricks. Entry tickets to Legoland start at Dh250. Visitors also have the option of buying an annual pass, which costs Dh765 per person. The 234,000 square foot Riverland is the entryway to the three main theme parks. It features four main zones: French Village, India Gate, Boardwalk and The Peninsula, where visitors can enjoy concerts. If you want to cool off, you can visit Legoland Water Park, but only starting from November 15 this year. Bollywood Parks is also expected to open on that day, while Motiongate is scheduled to open on December 16. DXB Entertainments, formerly known as Dubai Parks & Resorts PJSC, is listed on the Dubai Financial Market (DFM). Its loss in the first six months of this year ending June 30, 2016 expanded to Dh134.6 million, against Dh28.5 million in the same period last year on account of administrative and marketing expenses.